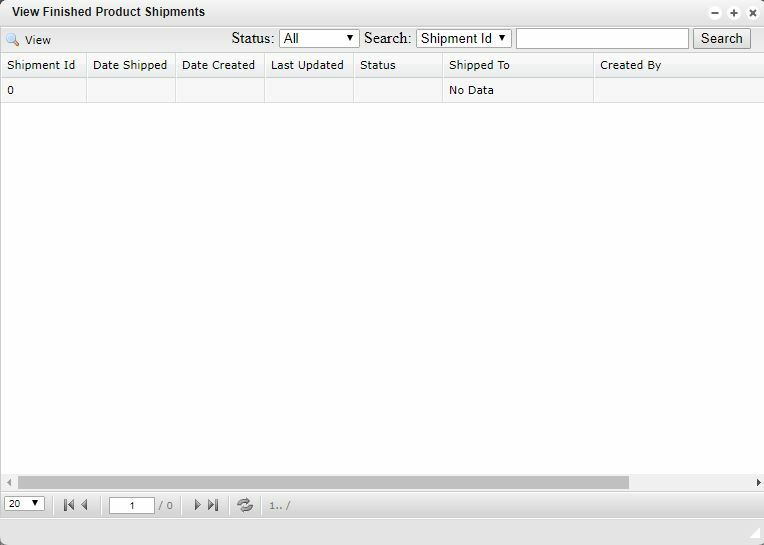 The View Shipments window shows a list of all finished products shipments that have been created. On this page, you can find information about current and past shipments including the date the order was shipped, when the order was created and when the order was last updated. Other information available on the View Shipments window includes who the order was shipped to, the shipping status and who created the order. Unlike other windows in Virtual Office, only one shipment can be selected at a time from the View Shipments page. With your desired shipment selected, click the view button to expand the details about the order to open the Ship Finished Product window. From this screen, you can also modify the shipment details or make changes to the order as needed. After edits have been made, the order must be resaved.